It seems like just yesterday I found out that I was pregnant with Athena. Now, she’s four months old! How did that happen? I felt so prepared for her arrival. We had everything that we needed to take her home and comfortably welcome her into this world, but she is growing so quickly and she learns something new every day. She laughs; with the cutest little giggle, she can melt my heart. She recognizes my voice; when I sing, she is instantly soothed. She looks intently at me; when she watches my every move, I know that I’m the most important person in her world. She’s actually growing out of her clothes and tummy time gets longer almost daily. The time had come to put away the 0-3 month clothes and think about crawling, walking, and eating solids. 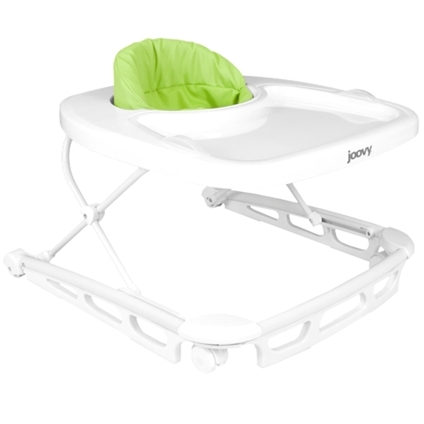 For a few of our most important baby product needs, we chose Joovy. They recently introduced a new line-up including a walker, a potty, and a step stool. Things change so quickly, I figured I would get all three and be prepared for the next few “steps”. After all, the last four months went by in the blink of an eye. products into one to provide the perfect balance of eating, playing, and learning to walk! The Spoon, with its bright green color, blends perfectly into our forest themed room and fits well with the other green products. 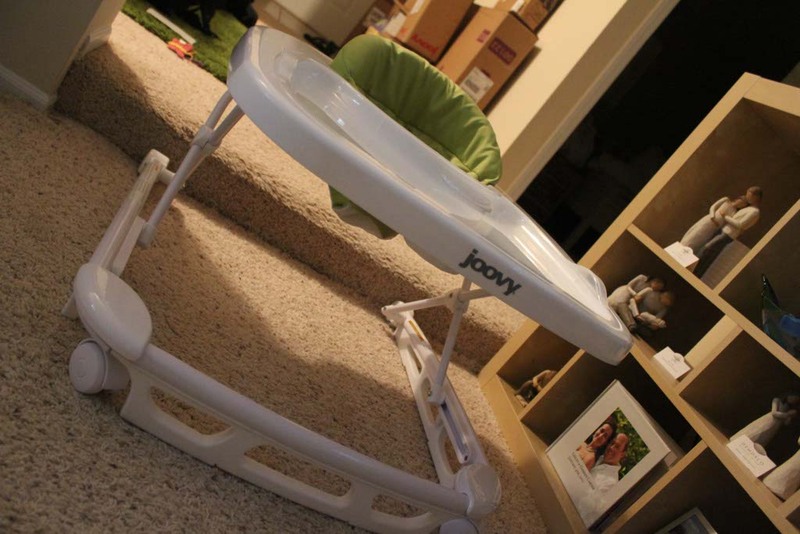 It comes with a super-sized tray that has a removable insert and an ultra-wide base for strength, stability, mobility, and safety. Most importantly, it’s easy to clean and wipes well with a cloth. With a comfortable, supportive seat pad and three height positions, Athena can sit upright unassisted. The cushion is comfortable against her back and legs and she loves the freedom to move her feet on the floor. Built with steel reinforcement, oversized wheels, and non-slip stair pads, you’d think the Spoon would be heavy and bulky, but it is one of the lightest baby products we own and it stores just about anywhere. It was easy to set up and came out of the box almost ready to go. I only needed to install the seat pad and adjust the height. I love when baby products are simple to use and serve multiple purposes. The Spoon is a great addition to our baby products collection. Although we’re not at the potty stage just yet, it comes so quickly that we wanted to be prepared. 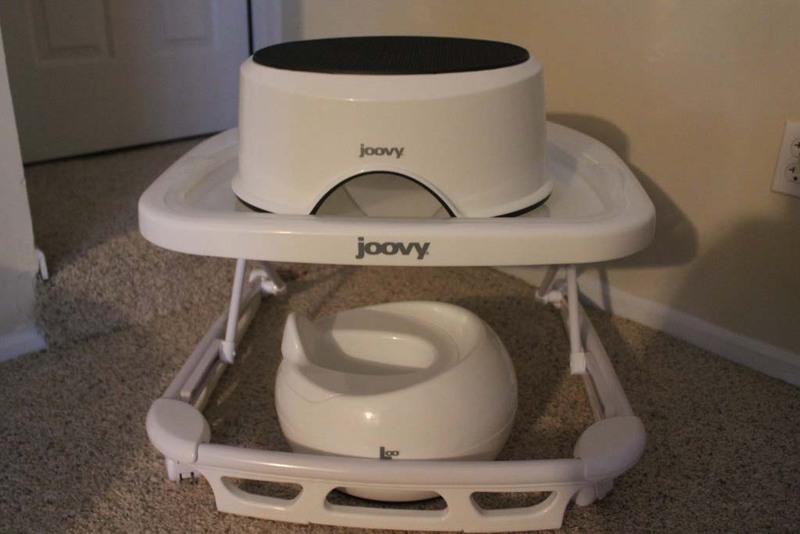 The Joovy Loo combines contemporary styling with watertight cleanliness. 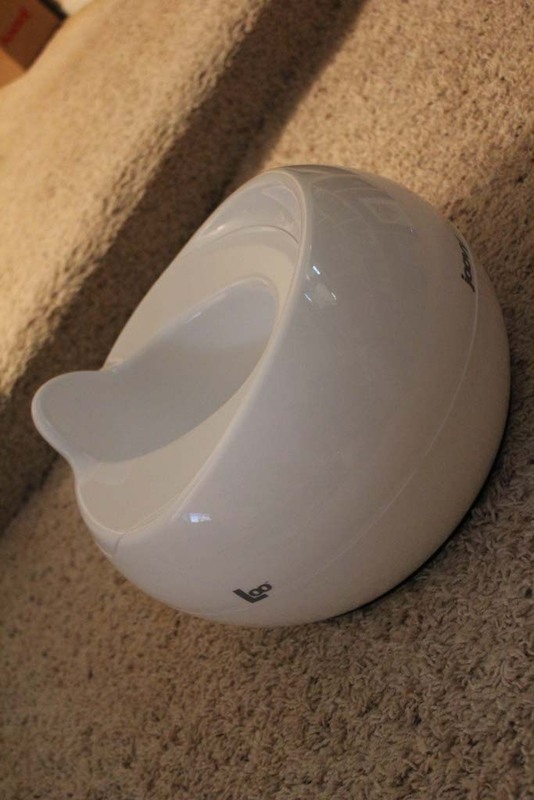 It has a completely sealed inner bowl and has been designed with only two parts that fit cleanly together with no nooks or crannies for spill overs to get trapped. There is no assembly required and it is small enough to easily store until she’s ready to “go”. The next “step” in the learning process will be the actual toilet; I told you things go by quickly! 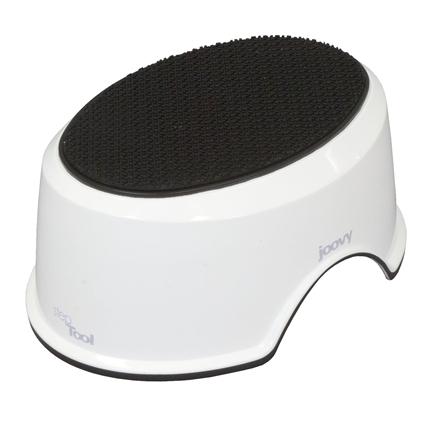 The Joovy StepTool combines cutting edge design and sturdiness to look great and perform even better. Whether using it to reach a kitchen counter, the bathroom sink, or the “big” potty, the StepTool will step-up to Athena’s needs. The sturdy construction is rated to support 300 lbs. and the non-slip top and bottom ensures both safety and stability. 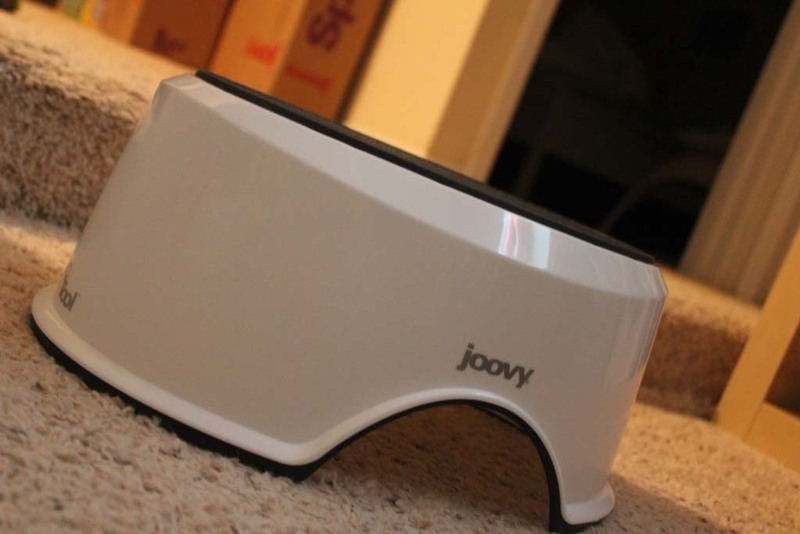 Form and function meet with the Joovy StepTool. The Joovy contest is now closed. The winner has been contacted and I’m waiting to hear back about a shipping address. Thank you to everyone that has entered and stay tuned for future contests. It’s easy to see that Joovy has thought of it all, even when I haven’t. Do you want to see for yourself? 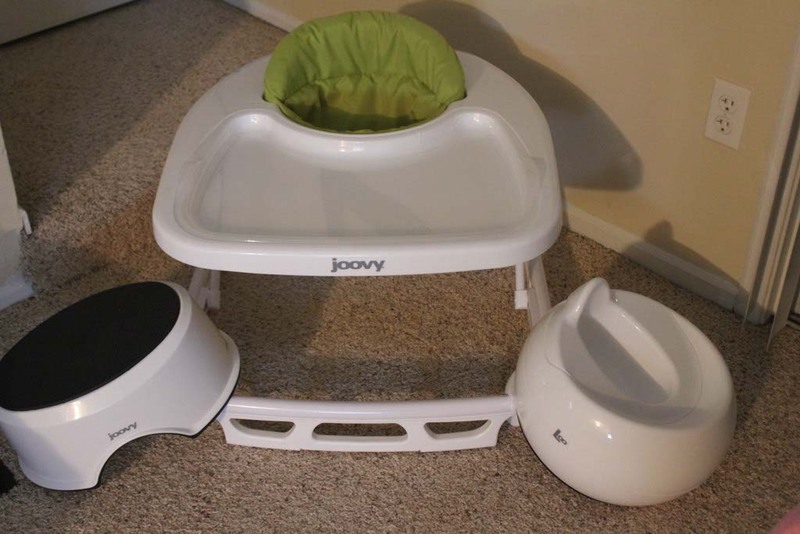 You can win all three Joovy products by entering our I Love Joovy Giveaway. 1. Like this page and include a comment below telling me you’ve done so (I’ll need access to your contact information, which is possible by way of you commenting below). 2. Like Bucket List Publications on Facebook and include a comment below telling me you’ve done so. 3. Tweet this post and include a comment below telling me you’ve done so. 4. Reblog this post and include a comment below telling me you’ve done so. 5. Share this post on Facebook and include a comment below telling me you’ve done so. The winner will be chosen on August 9th and notified via email. Good luck and thank you for reading Bucket List Publications! I liked the post and I can’t wait to see who the winner is! My wife would be so proud of me if I won this all on my own. She’s due in October and it’ll be our first. Count me in. I liked the post. I love your giveaways. You have everything from grills to baby toys. You are a true adventurer and the best is yet to come with your new baby. Love it. Liked it. Hope to win it. Perfect timing. I liked it and I’m sure my daughter will too.